That’s the sound of a hydrogen bomb exploding, and the sound of gold prices rocketing higher as a result. North Korea detonated a nuclear weapon early on Sunday, Sept. 3. This was the sixth time they had done so, but the first time since their ICBM missile tests and the first time under President Trump’s administration. This test was different in another important way. It is estimated to be a hydrogen bomb instead of an atomic bomb. The difference is significant. Both types of nuclear weapons work by releasing neutrons in critical-state radioactive material, either highly enriched uranium or plutonium. The difference is that the atomic bomb works by fission, literally “splitting” an atom, so that a neutron is emitted, collides with other atoms and causes a chain reaction with an enormous release of energy. The hydrogen bomb works by fusion. Atomic particles are “fused,” or pushed together, in a way that destabilizes the atom and also releases a neutron. Both methods start a chain reaction. But the fusion method in a hydrogen bomb is orders of magnitude more powerful. 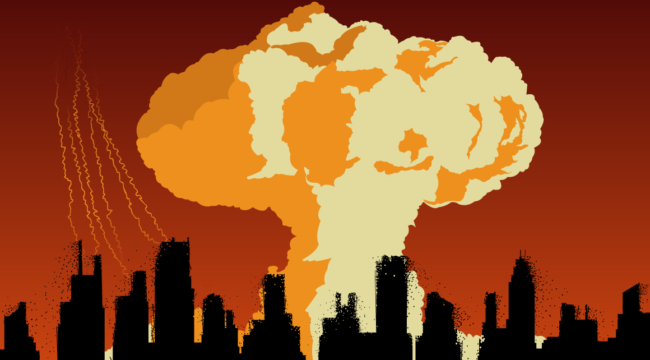 The destructive force can be 100 or even 1,000 times greater than that of an atomic bomb. This gives North Korea many more options in their attack scenarios. They can put more destructive force in a smaller space, thereby achieving the warhead miniaturization needed to fit on an ICBM. They do not have to worry as much about accuracy. An atomic weapon has to hit the target to destroy it. A hydrogen bomb just has to come close. This means that North Korea can pose an existential threat to U.S. cities even if its missile guidance systems are not quite perfected. Close is good enough. Finally, a hydrogen bomb gives North Korea the ability to unleash an electromagnetic pulse (EMP). In this scenario, the hydrogen bomb does not even strike the Earth; it is detonated near the edge of space. The resulting electromagnetic wave from the release of energy could knock out the entire U.S. power grid. Good luck with your bitcoins in that scenario. These threats are existential from a U.S. perspective. Deterrence does not work when the opponent has so little to lose. Kim Jong Un tortures and starves his own people on a good day. At times the North Korean people have been reduced to eating bark from trees. Why should Kim Jong Un be deterred by U.S. threats to attack if he and his ruling elite are secure in their bomb-proof bunkers? It’s too late for negotiation or diplomacy. That conclusion is based on what is called “breakout” behavior. It’s one thing to develop these weapons in baby steps and back off when the major powers confront you. Then you negotiate some concessions, wait a few years and break your promises. Wash, rinse and repeat. That’s what Iran has been doing for 20 years. Breakout is different. It’s more like football when you’re in the red zone and decide to throw a pass into the end zone. You just go for it. Kim will not be deterred now. He believes the U.S. is bluffing. He believes he’s safer with nuclear weapons than without them. He’s going for it. The U.S. only has two choices now. The first is to do nothing and learn to live with nuclear blackmail from North Korea. The second is to attack, probably in the next three–six months, to destroy the Kim regime and its weapons programs. Trump will go for the attack option. You don’t even need to ask what will happen to gold prices in that scenario. They’ll move quickly to $1,450 per ounce and then much higher from there as the repercussions begin. The time to acquire physical gold and gold mining stocks if you don’t already have them is now.